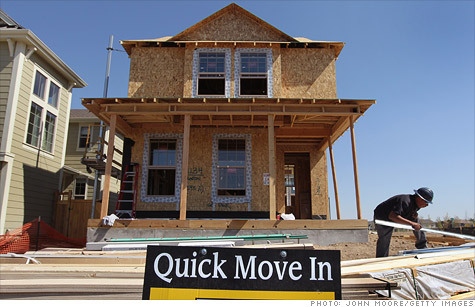 Builders are anticipating a strong housing construction season. NEW YORK (CNNMoney) -- Home builders are getting ready for a stronger construction season, filing for the most building permits in more than three years, in another sign of recovery in the long-battered housing market. The government reported builders filed for permits at an seasonally adjusted annual rate of 717,000 in February, the strongest reading since October 2008, which was the month after the meltdown in financial markets. It marked a 5.1% rise from January and a 34.3% increase from year-earlier levels. Actual starts of new homes slipped slightly from a very strong start to the building season in January, down 1.1% to 698,000. Still, that was 35% ahead of starts in February 2011. The starts are more affected by weather factors. But the permits are generally seen as an indication of builders' confidence in the market and the demand they are seeing. Mortgage rates near record lows and an improving jobs market both are feeding stronger demand. The construction and permitting of apartments and condos continue to be particularly strong. Permits for buildings with more than one housing unit rose 61% from prior-year levels, and starts of buildings with five or more units jumped 29% from January and were more than double year-earlier levels. New home construction is still only a fraction of levels during the building boom in the middle of the last decade. But years of low building since the housing bubble burst have left inventories of new homes for sales at a record low, helping to spur more activity by builders. Stocks of major home builders such as PulteGroup (PHM, Fortune 500), D.R. Horton (DHI, Fortune 500) and Toll Brothers (TOL) have all posted double-digit gains in the last three months. Home supply retailers such as Home Depot (HD, Fortune 500) and Lowe's (LOW, Fortune 500) have also reported strong sales and profits, and their stocks have rallied as a result. The home construction industry is an important driver of the overall economy, creating demand not only for construction workers but also manufacturers of various goods used in new homes, from major appliances to furniture to general housewares. That's one of the reasons that housing and home construction have historically helped to lead the U.S. economy out of downturns. So the strong hopes for the building season ahead are seen as good news for the broader economy as well.